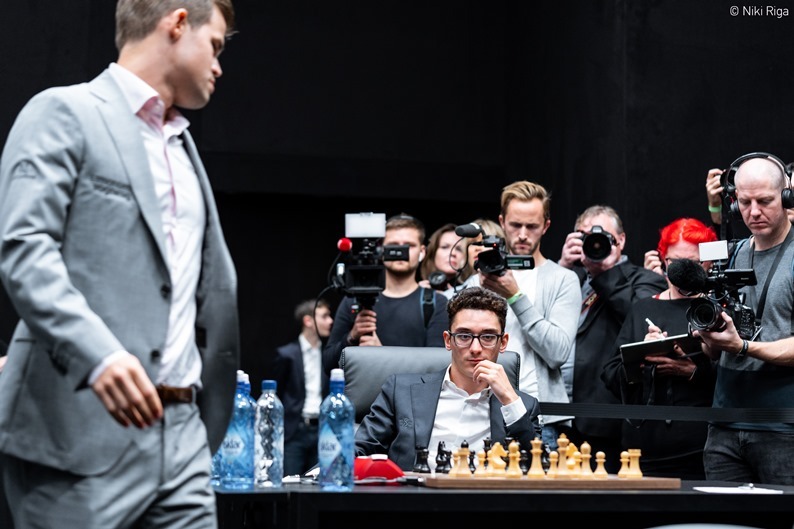 Magnus Carlsen had White in Game 2 of the World Chess Championship in London, but like Fabiano Caruana a day earlier he soon found himself in trouble. Fabi’s 10th move came as an unpleasant surprise and Magnus took the decision not to take on his opponent in the most critical variations where he’d be competing against deep human and computer analysis. The path he chose eventually led to a 49-move draw, but it involved engaging what he called “full grovel mode” as he held a rook ending a pawn down. Going into the first rest day the match is all square at 1:1. This was the only day of the 2018 World Championship match when we’re going to be without commentary from Peter Svidler (who was otherwise engaged in the Chess Bundesliga), but fortunately Alexander Grischuk had come prepared! 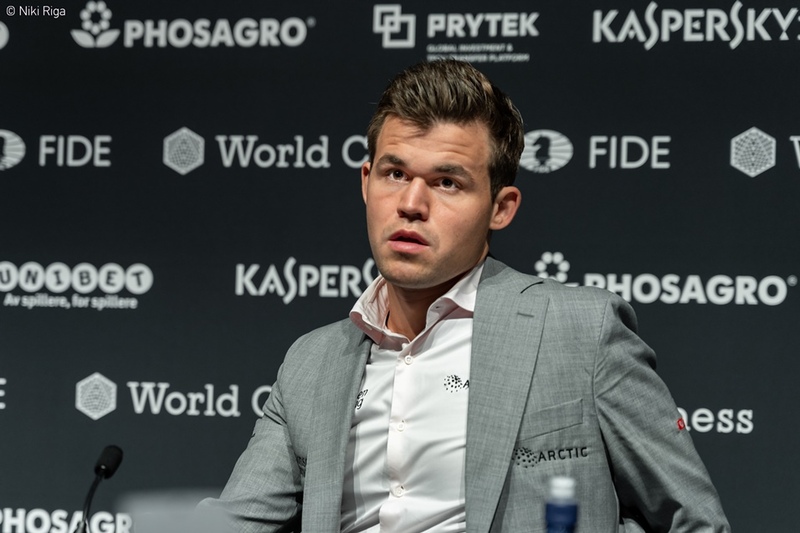 The first moves of the first games of a World Chess Championship match are always fascinating, as we get a glimpse of what the players and their teams have been spending months, or sometimes years, preparing to surprise their opponents. In some cases, such as Vishy Anand’s match with Vladimir Kramnik in 2008, that can involve as fundamental a surprise as the Indian no. 1 switching from his trusted 1.e4 to 1.d4, in one fell swoop rendering vast swathes of Kramnik’s opening preparation irrelevant. Nowadays, by and large, everyone plays everything, but we still wondered on Saturday in London if we’d get to see 1.e4 from Magnus and, if Fabiano picked the Petroff that had served him so well this year, if we’d find out how it can be refuted! Or would he switch back to the Berlin and perhaps signal a new shift in chess fashion? Instead, though, Magnus picked 1.d4, and soon Fabiano was playing the Queen’s Gambit Declined. He played faster than the World Champion and with 6…c5 departed from the 6…Nbd7 that had seen him score some unimpressive results a few years ago. The moment of truth, however, came on move 10. At the post-game press conference Magnus graphically shared his emotions at that moment! Basically there are two main moves for Black, 10…Re8 and 10…Be7, so it’s kind of unpleasant to face a move that’s clearly based on some very, very complicated variations, and to be out-prepared. I think there’s a very clear parallel to one of the games between Korchnoi and Karpov from the World Championship in 1978, where instead of Rd8, Re8 was the new move that Karpov invented, then Korchnoi actually thought for a long time and almost refuted the move over the board. Improvements have been found for Black, but he actually managed to find a solution there. The difference now is I’m facing not only the analytical team of Fabiano and his helpers, but also his computer help. Yes, I have some aggressive instincts, at least! I just couldn’t make it work and I figured he was still in prep… There was way better equity in playing it safe and securing the draw. It’s hard to say what will happen going forward, but this seems to be a trend in modern chess, that you have a lot more freedom to manoeuvre with Black. With computer analysis it turns out that a lot of variations are playable which were once considered dubious or unplayable, so new variations keep popping up and there’s a lot of creative freedom with Black. 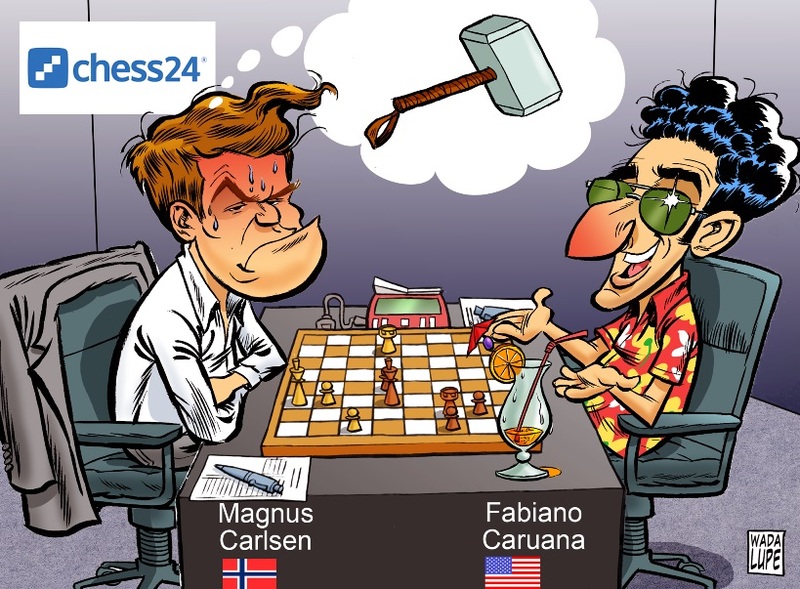 Is Magnus worried at the first sign that his opponent is capable of surprising him? I’m not saying it scares me, but it certainly does mean that he’s willing to go his own way and not only follow mainline theory, which is nothing new obviously, but it makes for possibly more excitement. The scores are now level at 1:1 as both players go into the first rest day of the match with a lot to ponder. 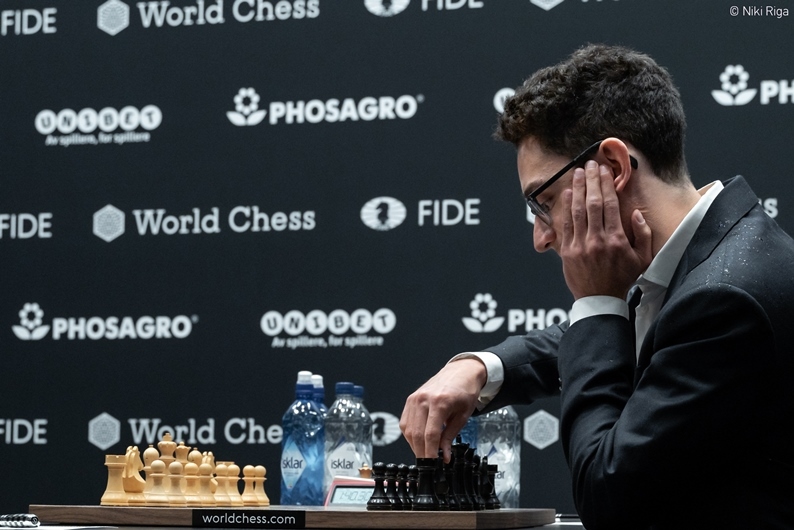 Battle recommences at 16:00 CET on Monday, when Caruana will have the white pieces, and Peter Svidler will be back to join Sopiko Guramishvili and Alexander Grischuk commentating on all the action. Before that we’ll have Banter Blitz with Sopiko Guramishvili at 17:30 CET on the rest day, Sunday 11th November, when as a Premium member you get a chance to challenge Sopiko to a game!